With the Doctor on his own after the events of ‘Relative Dimensions’ and with only one story to tell before the two-part series finale, writer Eddie Robson takes the opportunity to craft a prolonged and heightened situation to study the character of the Doctor in much greater depth than is usually allowed. Six years after being captured by the enigmatic group known only as The Consensus, the Doctor still finds himself trapped aboard a complex situated at the heart of an unstable sun, condemned to eternal management of its systems to avoid the star’s collapse and the resulting death of billions of innocent lives on the two planets nearby. Helped only by a line of android assistants and watched over by the liquid Mercurials, the Doctor soon finds himself squarely in the eyes of a rebel force willing to risk the destruction of all. The conceit behind the Doctor’s imprisonment is a magnificent one, and the fact that he has figured out long ago how to escape but knows that actually doing so will ensure the deaths of so many creates a brilliant moral conundrum that squarely calls into question the value the Doctor places on his ow personal freedom. This is expanded even more impressively once the rebel Hagan arrives and insists that the sun poses no danger of collapse and that the Doctor is, in fact, keeping himself imprisoned simply because his code of ethics will not let him leave. Of course, the Doctor is not willing to risk so many countless lives on the word of one man, creating a cleverly shifting sense of what is true and what is false that runs throughout the story until Hagan finally comes clean and admits that he has taken it solely upon himself to end the rebels’ war against The Consensus by using the sun to destroy the last remnants of his enemy’s stronghold in the system. Of course, the Doctor never truly works by himself, and so as he begins to contemplate whether his time aboard the complex is the result of a hoax rather than a necessity it’s not surprising that he would try to use all of his surroundings to his advantage. In this case, those surroundings include a series of androids that he programmes with the very best characteristics and the voice of Lucie Miller, at the same time proving that he has certainly not forgotten his previous companion and how much she meant to him. Staging a murder attempt with the third model, the Doctor proves just how resourceful he is when that model later returns after escaping custody with reports that confirm his fear that the premise of his imprisonment has been falsified. Ultimately, though, the drama is a little bit undone by the fact that the Doctor proclaims both that he is the only one who is clever enough to run the systems and that he believes this situation may be fake. These statements mean that the story can only really end in one way, and given how quickly events slot together here it’s surprising that it has taken the Doctor six years to reach this point. 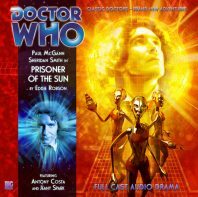 Nonetheless, with Paul McGann exemplifying a steadfast but wary Eighth Doctor a direction that maintains a great sense of pace and confidence, ‘Prisoner of the Sun’ is a strong experiment that studies the character of the Doctor himself wonderfully.